The Advancetec AT-FX Force Nine is very much the basic PC, but is still gives impressive performance in the latest games, belying the simple exterior. The P31-based chipset from ASRock is hardly the motherboard of choice for the enthusiast, but manages to offer support for Intel's latest 1,333MHz FSB processors. Nestling in that CPU slo, marvellously, is a £170 chip in the guise of the Q9300; a 45nm Penryn clocked at 2.5GHz. Even more extraordinarily is the fact that it comes overclocked to 2.7GHz just using Intel's horrible stock cooler. Alongside the 9600GT, the Penryn is the reason for the Force Nine's impressive showing. The RAM is less impressive, as the memory limitations of the ASRock board stop at the 800MHz range. 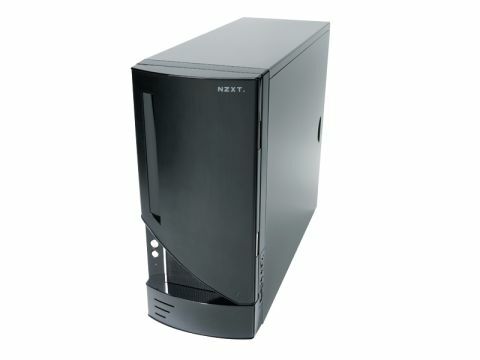 It's from solid OCZ stock though and performs adequately. Again the PSU is erring on the side of budget with a WinPower 650W supply. I was half expecting it to whine like the VTOL jet on a Harrier, but it was quickly drowned out by the Cape Canaveral stylings of the 9600GT starting up. Once the boot-up screen has vanished things soon settle down and the rig purrs away happily. A common cash-saver on the budget rigs is the storage and the Force Nine is no exception, with a measly 160GB of space - a new HD will be fairly high on the upgrade wishlist. A new motherboard will probably be up there too, but for a start-up rig the Force Nine offers decent gaming scores. At only two fps less than last month's 9600GT SLI rig from IT-Partner on the Crysis test you're hardly going to notice the difference in-game. Performance on World in Conflict at the high end is likewise impressive, again only a few frames behind the SLI setup. It's not quite the out-of-the-box gaming setup that we've seen from Cyberpower, as it requires a panel and input peripherals, but it's a gaming machine that wil stilll cope admirably with the latest titles.